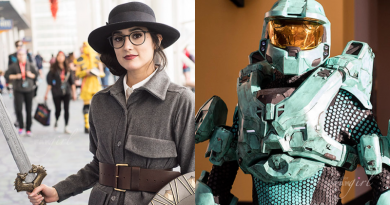 Fangirls Around the Web is a regular (sort of) series that highlights fangirls and heroines spotted around the web. San Diego Comic-Con had so much to cover in that regard it’s taken me a couple of weeks to get back on track. Some of these items are older, but fangirls never go out of style. Dunc and Jawa James (honorary fangirl) of Club Jade were on Full of Sith, and not together. They both talk EU, Dunc covered reporting on SW news, and James gave fans some insight into Celebration Europe. 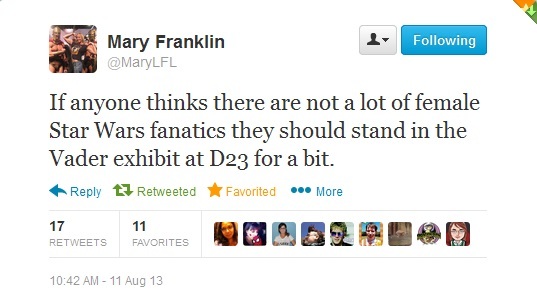 Mary Franklin previewed the Lucasfilm pavilion at SDCC. 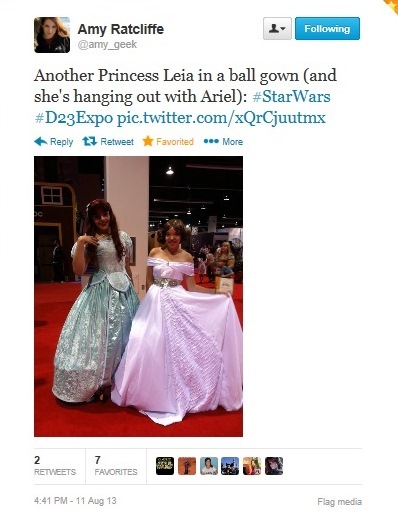 Amy Ratcliffe blog post at Star Wars Blog about favorite Celebration memories. 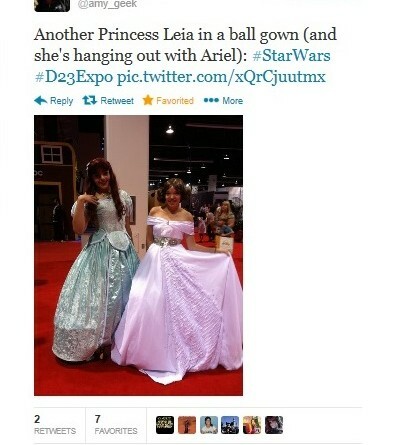 And a couple of fun tweets from both Mary and Amy from D23 are featured. Jenna Busch interviewed one of my favorite voice actors, James Arnold Taylor, over at Fan Voice. MTV Geek interviewed Ashley Eckstein, who reveals that she is looking to add gaming and comic book characters to Her Universe’s slate. Fangirls of the Day included: Kelly, Olivia, Mollie, Sarah, Michelle, Kelli, Gloria, Paula, Christina, Gina, Trinity, Jamie, Katie, Rachel, Kristi, Mariah & Danielle, Hannah, and Susana. #SDCC is all about passion. These young women are passionate about a post-apocalyptic sci-fi series. Embrace that ****, nerds. TheMarySue reports on the amazing list of female creative talent assembled by Gail Simone for Red Sonja: Legends, an upcoming short story anthology to celebrate the character’s 40th anniversary. 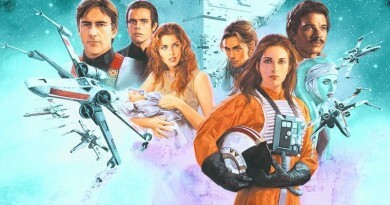 Geek Tyrant reports on Natalie Portman’s upcoming debut as a director for the film A Tale of Love and Darkness. Juliet Mushens at Tor.com has some great advice on Do’s and Don’ts in approaching literary agents. Anne Sowards tweeted the link to the Ace/Roc sampler from SDCC. EW.com reports on some new voice talent added for the second season of The Legend of Korra. 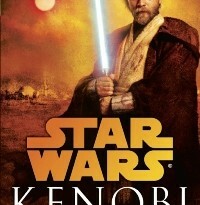 Dark Horse Comics recently released a new book featuring the art from Book One. Lisa Granshaw shared this amazing bodycon dress with art from Marvel comics. Forever 21 has partnered with Marvel for back-to-school fashions. Kay pointed me to this incredible article from The Atlantic on female fighter pilots in World War II. A New York Times article discusses gender roles in the culture of sexual activity on some college campuses today. Inspired by the “Nothing to Prove” video from The Doubleclicks, Tara at Geeky Hostess blogs about Why I Wear Pink. Pink is my favorite color, and at times I’ve felt as if it creates a double stigma, one from male geeks who are reluctant for feminine things in geekdom and also from female geeks who don’t like pink associated with them personally. I liked Tara’s approach. Moral of the story? There are a lot of people out there that still don’t quite “get” that women can hold their same interests or intelligence. Getting mad about it or tweeting about it probably won’t help them. Correcting their misinformation in a friendly and informative way will. Lead by example–be friendly and welcoming to those in the geek community, turn offhanded half-insult/half-compliments into an opportunity to chat about your passions, and if someone is being rude or threatening, walk away. And if you want to wear a pink skirt, wear it with pride.